If you’ve ever had an x-ray, CT scan, or even MRI scan, then you already know what an MR neurography is like. MR neurography scans are conducted under standard MR imaging scanners such as the one depicted here. 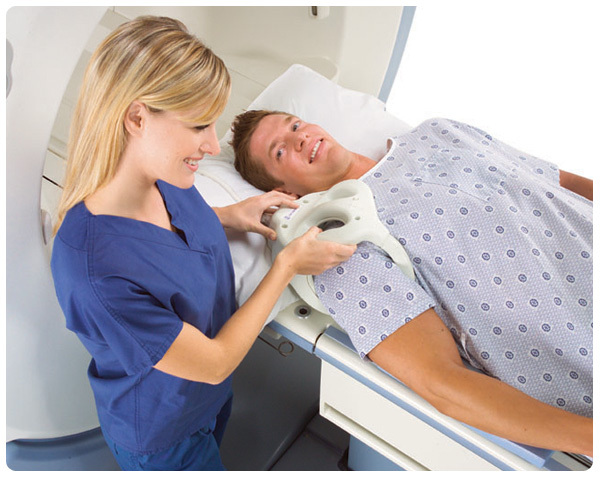 You lay on a scanning table and your body is passed into the scanning station automatically (or, underneath the scanning magnet, depending on the physical design of the MRI scanner itself). The entire process can take as little as a matter of minutes, or as long as a half-hour or more, depending on the number of scans required. No injectable dyes are used and there is no pain and no ill after-effects whatsoever. The entire process is comfortable and completely without discomfort. No shots, no prep – nothing. Just show up and have a quick scan – that was it! Most important is that you receive your MR neurography scan from the world’s leading licensed source and pioneer in neurography imaging – The Neurography Institute. Because without a real MR neurography scan, your doctor will not be able to pinpoint the source of your condition and provide an effective course of action to resolve it. Trust your health to the leading licensed source for MR neurography – The Neurography Institute.